Saranya Chumsri, M.D., (left) with Kristin Ferguson. One of the most devastating side effects of breast cancer treatment for many women is losing their hair. A new treatment called cold cap therapy is helping some women eliminate that concern. Brandy Hourihan had two thoughts after being diagnosed with breast cancer. "The first thing you think of is 'Oh my god, am I going to survive this,' and almost the second thing you think of is 'I don't want to lose my hair,'" Brandy recently told First Coast News. Those concerns may seem worlds apart. But for women facing breast cancer, losing their hair can be devastating. So devastating, in fact, that some "even decline or refuse lifesaving chemotherapy treatment just because they don't want to lose their hair," Saranya Chumsri, M.D., tells the station. That's why Dr. Chumsri, an oncologist at Mayo Clinic's Florida campus, is excited about a new treatment that's helping Brandy and other women at Mayo Clinic. It's called cold cap therapy, and it allows some patients — almost 70 percent according to one recent study — to keep their hair during treatment for breast cancer. Here's how it works. 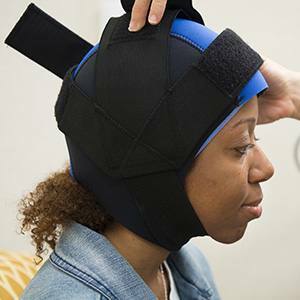 Patients wear a custom-fitted cap that has cold liquid circulating through it. A computer attachment keeps the temperature steady at about 32 degrees. "Essentially, your head is frozen," Kristin Ferguson, another patient, tells Action News Jax, comparing the feeling during treatment to an "ice cream headache." The cold constricts the blood vessels in the scalp, which "helps limit how much chemotherapy flows to certain parts of the body," Dr. Chumsri says. That blocks the chemotherapy drugs, so the hair is protected and can continue to grow. For Kristin, the temporary pain of treatment came with a whole lot of gain. "I have three boys and I didn't want them to think I was sick," she tells the station, which notes that Kristin's hair "thinned slightly but still remained full during chemo thanks to the new technology." Kristin says she initially thought her desire to keep her hair was about "vanity." But she's come to see it as something else: "self-preservation." Vikki Korves agrees. "I inherently knew if I could look like myself, I would feel better," she recently told The Florida Times-Union. Cold capping let her keep much of her hair. "This may seem odd," she tells the paper, "but I really believe I had fewer side effects from chemo because I looked like me." Dr. Chumsri says it can be good medicine for patients to see a familiar face when they look in the mirror. "The fact that [patients] don't have hair … reminds them every single day that they have cancer and are on chemotherapy," she tells the Times-Union. While cold capping doesn't cure the disease, "just the fact that they can keep their hair makes a whole world of difference." You can learn more about cold capping from Mayo Clinic Radio. Then make a world of difference to us by leaving a comment below before using the handy social media tools atop this page to share this story with others. Explore the Center for Breast Health at Mayo Clinic in Florida.